Max Headroom is finally on DVD. And we have it. I like to think that I remember the show because of the writing. Max was one of the first shows about the media, and how the modern life has become more and more entwined with television. The plots were fairly standard (Ace reporter Edison Carter discovers an injustice, and gets on the air at the last moment to right the wrong). But the MacGuffins that drive the stories are very perceptive and unusual. The conflation of television and politics is particularly relevant today, when we have television personalities holding political rallies, and getting the nation whipped up over this molehill or that. 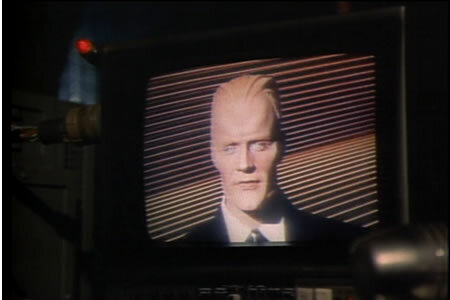 While we have not reached the point of Max Headroom where it is illegal to turn the television off, there is precious little difference between someone who can't turn their television off, and someone who won't. The plots also usually depend on there being someone moral in a chain of events that will say "no" to the murder or imprisonment of an innocent person. For every monster out there, there is a moral individual who is able to stop them. Considering that the show is remembered for being very 'cynical' Max Headroom held the positive view that someone in the chain of command can stop an atrocity. Part of the fascination with the show, twenty years later, is how close it comes to being real. The episode "Academy" features a show trial on Network 23, which is rather creepily reminiscent of the OJ Simpson trial. Amazingly, in the dark future, there are few guns, and no one gets shot. I wonder if this is primarily because the writes of the show were English, rather than American. None of the show's problems have yet been solved through violence. It's the tool of terrorists and fascists. The characters spend a lot of time watching screens and watching people interacting with screens. And not just because Max, the titular character, is confined to one. It's rather disconcerting... there's about as much face time as there is someone talking to someone over a screen. And there's more tapping on keyboards than Jessica Fletcher ever did. Max should also be remembered for the contradiction he was. A prime-time show that critiques the media it was on. An anti-media icon that shilled for Coca-Cola. Did the producers and writers of Max sell out? Or were they cleverly co-opting a media to get their message out? It's hard to tell, but it's a lot of fun to analyze. How Do You Follow Something Like That Up? 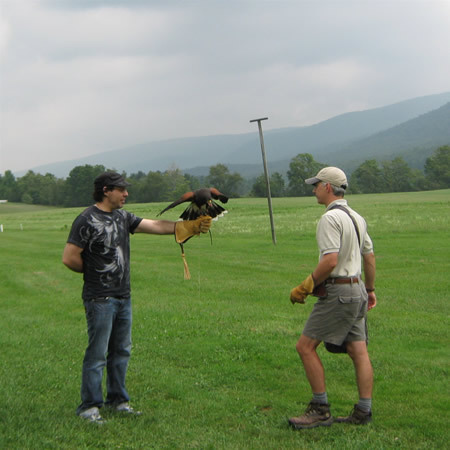 I mean, what can I possibly say on this blog that is half, even a quarter as cool as "I had a hawk eating off my hand"? I guess I'll have to take some time and shamelessly self-promote. “Captains of Industry” by John Goodrich - Mr. Goodrich is just starting his career as a published author. “The Patriot” was among the many highlights of Cthulhu Unbound 1. Two impoverished immigrant factory workers, struggling to live and struggling in the battle for workers’ rights, infiltrate an industrialists’ dinner party to try to get some leverage. They run afoul of the Hermetic Order of the Silver Twilight. Once again Mr. Goodrich gives us a rousing story of superior quality. His characters come alive on the page and the action is actually heart wrenching. I'd like to point out that I'm very proud of this. Horrifying a reader with a horror story isn't all that difficult. Getting them emotionally involved with the protagonist is more challenging. I seem to have touched Mr. Carpenter's heart. I am pleased. The Santa Fe Good Taste Factory was in the area, so he decided to spend a few days with us. Which is awesome. He is always fun to be with, and when someone visits, I usually look around and find something interesting and local to do. This time, I asked if he was interested in taking a lesson at the local branch of the British School of Falconry. So there we were, 11AM, scrungy as we usually are, walking up to this nice little barn. A very nice guy (Rob, I think) told us he would be our instructor, and we both hauled out our cameras and listened very carefully. 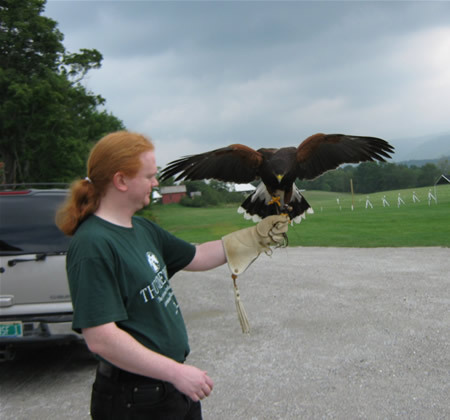 The first thing I noticed when I had a Harris Hawk sit on my wrist is that the talons are very sharp, and so is that beak. While the plumage is beautiful, and even more attractive up close, these attributes do not command immediate attention. I found it disconcerting, at first, to be so close to those huge claws on dinosaur-like feet. Did I mention his name was Mycroft? That took a couple of minutes to sink in. 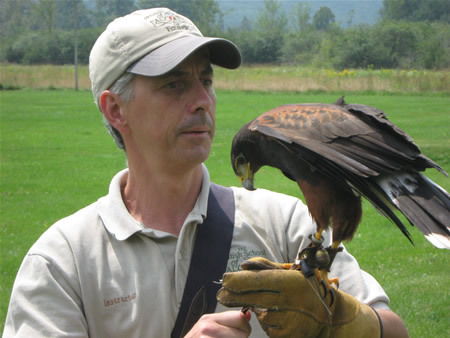 Harris Hawks are unique among raptors in that they hunt socially. 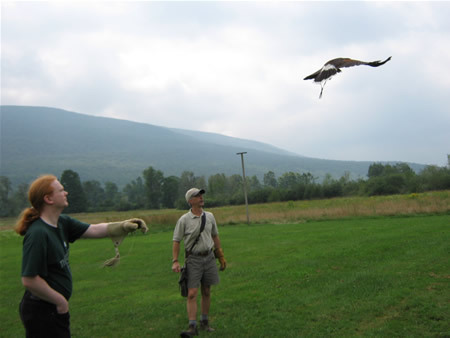 This gives them a huge advantage over non-social hawks as far as falconry goes, because they won't get all pissy if two or more go after the same target. Also, they're a fairly small for a raptor--three and a half foot wingspan, between one and a half and two and a half pounds (the females are larger). But up close, Mycroft is clearly a death machine. Attached to the bird's legs are three devices. One, some jingle bells so you know where it is. Second are the jesses, leather thongs so that you can hold onto the bird until you're ready to let him go. Think of them as bird-reigns. The bird steps onto your gloved hand, and you make a fist, clasping the jesses between your middle and ring finger. This keeps the bird in check if it decides to take off at the wrong moment. The third device is a radio transmitter with antenna, just in case the bird flies off. 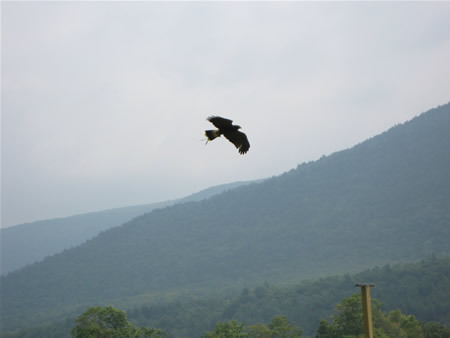 I learned that you have to walk so that the bird is always facing into the wind--otherwise they get agitated. Walking backwards is a small price to pay when you're keeping the Massive Sharp Beak of Death calm. Once we learned the basic tips, we were ready to receive the bird. Rob would cast the bird, it would go to a downwind perch. Then I raised my gloved arm, and Mycroft took off, and headed for me. Mycroft, apparently, flies lower than many of the usual birds, getting a bit of ground effect. Then he perfectly, every time, came up and landed on my arm. Stuck the landing even as he grabbed the little beefy treat the trainer put on my glove as a reward. Watching a bird land on your arm is really amazing, so much energy conserved, and yet each one is absolutely perfect (unless I screw it up). After a couple of landings, we learned to cast. This is something like throwing a rock or a baseball. You hold the jesses for a quarter second as you throw, giving the hawk a bit of a boost. So we managed to get the hawk off my glove and back a couple of times, and each time, Mycroft got a tasty treat. We did a little ranging after that, walking along, and the bird would make quick flying hops from, tree branch to tree branch to keep up with us. We could hear it only because of the jingle bells attached to its legs. So when you hear the jingle over your roof... it's probably not reindeer. Our hour was over far too quickly. 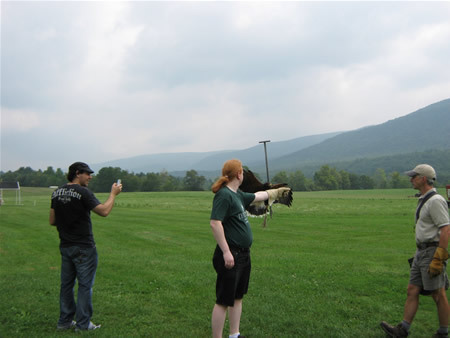 Falconry is hugely entertaining, because you've got this raptor doing its thing off your wrist. That last bit is incredibly strange, because we seldom get close to birds, let alone anything as magnificent as a medium-sized raptor. I got a real appreciation for the complexity of hawk flight, as well as for the difficulty in training hawks. I don't think I'll want to participate in the hunting aspect of the sport. It's the next logical step, and the next lesson, but I'm a lot more interested in the bird for itself than it coming back with a squirrel. Special thanks to the Queen of Science for the wonderful pictures.